Grandpa (Stillman T Cook) was a teenager when America was in the grip of the Great Depression. Like many young men of his day he found himself out of work and unable to find a job. In May of 1936 he went to City Hall in Norwich, Otsego County, New York and joing the Civilian Conservation Corps. The CCC was part of President Roosevelt's "New Deal" - his plan to help bring the County out of the worst economic crisis in its history. The program had been established in 1933. Young unmarried men between the ages of 18 and 25 who enlisted were sent to camps located on State or Federal lands. These camps of about 200 men each worked on projects that ranged from planting trees to building roads and park facilities. They received $30 a month, with $25.00 going home to their families. In addition to their room and board, the enlistees also received training in a variety of job skills. The enlistment period was for six months, and an individual could re-enlist for a total of two years. Grandpa's enlistment paper is found below. Note that he was living in Norwich at the time and had worked as lumberjack and a farm laborer before enlisting. It is no surprise that he wanted to be a musician when he left the CCC's. 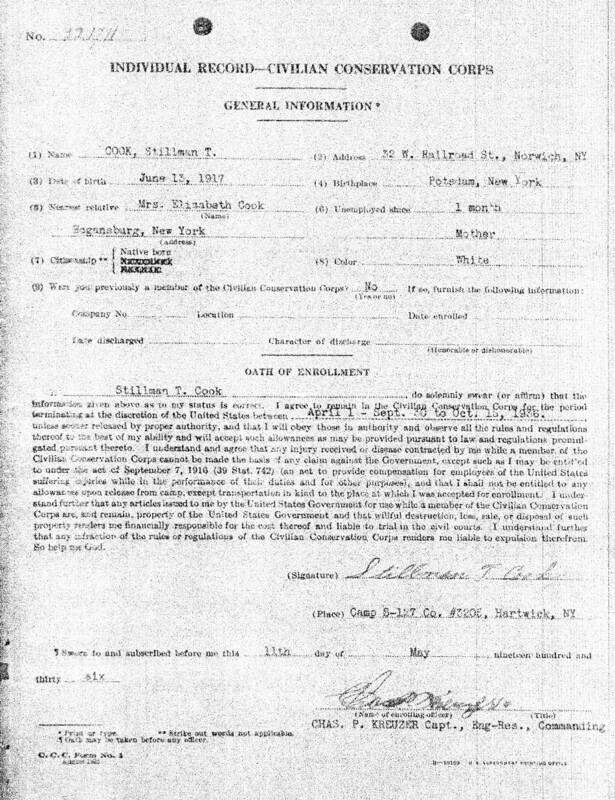 Also include is a page from his Individual Record identifying the camp. It is interesting that he is listed as "white", not Mohawk. There were companies for Native Americans, often based on or near reservations where enrollees would live at home and work during the day. Evidently there was either not one at St. Regis, or he chose not to join it, possibly because he had already left home and the reserve. Grandpa served in Company 3205 at Camp S-127 in Hartwick NY for one enlistment period from May to October 1936. He was assigned first to the forestry crew, and later as a first aid attendant. At the camp he would also make a life long friend - Orlo "Shorty" Tarbox who we would often visit in Millport NY. Years later on a family trip to Cooperstown I remember that Dad stopped the car along a the highway. He told us that once he had been in the camp that had once stood in the heavily forested valley below us, and that he had helped plant some of the trees that we saw. 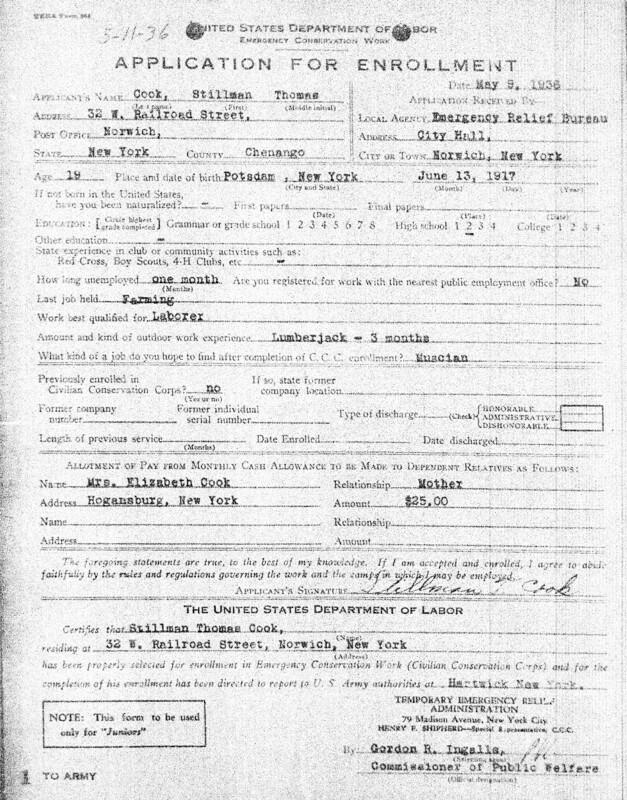 Now, thanks to the National Archives, we know a little more about Grandpa Cook in the Civilian Conservation Corps.